Dr. Sonny Goel continues to be recognized for his experience and exceptional patient care as he was named a "Top Doctor" for the second consecutive year by the Baltimore Magizine. From LASIK surgery to general Ophthalmology, Sonny Goel, M.D. is renowned for providing exceptional eye care to the Baltimore area. As a testament to his success as an Ophthalmologist, Dr. Goel was recently named “Top Doctor” by Baltimore Magazine for the second consecutive year. According to Baltimoremagazine.com, the 2017 “Top Doctor” feature is where you can find an exclusive list of physicians who other physicians would seek out, if their own family members needed medical care. 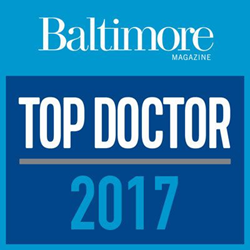 Baltimore Magazine chooses their “Top Doctors” through a survey of about 10,000 physicians in the Baltimore area, along with receiving input from physicians on Baltimore Magazine’s advisory board. As the region’s most prominent magazine, Baltimore Magazine’s “Top Doctor” feature is one of the most-read and sought-after issues in Baltimore. Dr. Goel has over 12 years of experience as a LASIK provider, and only provides 100% bladeless laser eye surgeries. He has effectively performed over 84,000 LASIK procedures, and takes pride in helping patients improve their quality of life with better eyesight. Dr. Goel’s remarkable patient care and experience as an Ophthalmologist has been acknowledged by other physicians in Baltimore, who have helped him achieve the “Top Doctor” award for the past two years. Beyond his memberships, he has been recognized by Southwest’s Spirit Magazine as the “Best LASIK Surgeons in America,” and by Trusted LASIK Surgeons™ as being in the top 1% of LASIK and cataract surgery providers in the United States. Learn more about Dr. Sonny Goel here.